Tell me if this story sounds familiar: in order to save their child’s life desperate parents put their infant son into a small craft and him adrift. That child is then found and raised by a loving couple as their own and this child will one day grow up to be a protector of people. Did I just give a brief summary of the story of Moses or Superman? 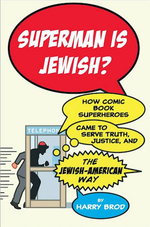 Harry Brod’s new book “Superman is Jewish?” poses such questions in an attempt to answer the question of not only if Superman is Jewish but what makes a character Jewish. How about if I throw in that his creators were both Jewish? How about if Kal-El is very similar to the Hebrew words for “voice of God”? How about if you look at the character as the wish fulfillment of displaced European, Jewish boys in the 1930’s and 40’s? Clark Kent is a first-generation outsider who appears as a weak and book-worm like figure who in all reality sheds this image to become a fountain of power. NOW is Superman Jewish? Or is he not Jewish because it’s never specifically stated in the comics? Mr Brod’s book starts focused like a laser and then slowly diffuses outwards becoming more and more broad as you continue to read. After discussing Superman specifically he moves on to such characters as The Thing (what is The Thing if not a retelling of the Jewish story of the Golem a creature of mud to protects his people), and Spider-man (a character who is driven by a guilt because his inaction caused the death of his Uncle Ben, who lives in Forest Hills a mainly Jewish area of NYC in the 1960’s, and is a glasses-wearing, nerd-like social outsider who was created by Jewish Stan Lee with possible input by a Jewish Jack Kirby). He then takes a tour of a few of the most prominent Jewish creator’s works such as Will Eisner and Art Spiegelman, and finally finishes up discussing Jewish comics in general. Let’s be honest here, books such as these are in essence very long, (hopefully) well-researched, thesis papers so in my mind there has to be a compelling reason to read a book like this. So, is the book worth reading? I believe it is. I suppose the casual reader might be happy just reading their comics and taking them at face value. But for a group of people who claim to be passionate about an art form as most comics readers proclaim to be, to not want to dig deeper and find a possible hidden influence on some of comics’ most popular characters strikes me as wrong. I enjoyed this book. It was never dry but instead came across as almost conversational in tone which always makes it easier to read a book of this type. The author does an excellent job of exposing the bedrock upon which comics has been founded and this book is worth reading just for the chapter on Art Spiegelman’s Maus alone. The analysis in that chapter and the details in story structure, panel layout, and background details will give any reader of that seminal work a reason to go back and reread. I can recommend this book to any reader who wants to gain a deeper understanding of this art form we all claim to love so much.